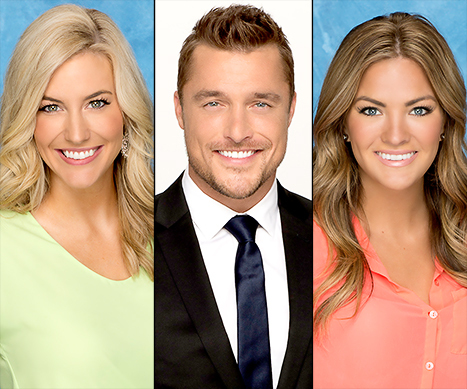 “It is now time for the dramatic season finale of The Bachelor!” said in my best Chris Harrison impression. Every season seems to fly by so fast!! I feel like we hardly know these girls! Will he pick Becca or Whitney and who does his family think he will be best with? Time to find out!! Chris Harrison greets the live audience and promises that there is a shocking turn of events! Ooooooh! Chris Soules is back home in Arlington, Iowa. As typical with The Bachelor, he’s in love with two different women and he can go either way and has no idea what he’s going to do. He meets up with his large family and everyone is pretty emotional to see Chris. He seems stressed and worried about making a decision. Whitney gets to meet his family first. Whitney comes into Chris’s parents’ house just full of energy and warm and loving. She tells the family about their trip to Chicago and about her life in Chicago. She also explains how she wanted to go on the show specifically because of Chris. She cries as she tells them how much she loves him and how much she appreciates being there with him. Whitney sits down with Chris’s sisters and tell them that she feels she can be a nurse anywhere and what’s important to her is love and family. She loves that Chris has a tight knit family and she wants to be a part of it. She gets a sense from the sister that they’re pulling for her. Chris sits down with his sister and they’re giving their glowing endorsement of Whitney. Chris then talks about Becca… and his tone is a lot more serious and is having a hard time articulating what he likes about her. He just states that they have a certain kind of chemistry. Whitney then sits down with Chris’s mother and tells her the reasons she loves Chris. Whitney is so poised and confident even as she talks about hard, emotional feelings. It’s nice to see someone express their feelings so freely with the whole family. I am not sure I could do that so openly. Chris’s mom comments that Chris is Whitney’s dream… what more could she ask for? Chris sits down with his brothers-in-law and father and explains the differences between his feelings for Whitney and his feelings for Becca. One of the things he points out is that Whitney has been expressive about her love for him but Becca has not. She hasn’t said she’s falling in love with him. His brother-in-law, Jason, questions if he’s more attracted to Becca because she’s the unobtainable one. He says as guys, they’re naturally more attracted to the woman at the bar that no man can get. Now it’s time for the family to meet Becca. She comes in very warm and a little more outgoing than I was expecting. At dinner she tells them about her road trip to Arlington she took with the other girls and jokes about how small the town is and the family laughs agreeably. Becca tells his sisters that after the show, it’s going to be long distance for awhile until they know for sure. She doesn’t want to move until they’re both absolutely sure they’re going to be together forever. The sisters then voice their concerns over Becca not knowing if she really loves him. They tell him that she needs to give a little more. Chris is hoping that Becca will be able to tell him that she loves him. Becca flat out tells Chris’s mom that she is not yet in love with him. But then Becca talks about these moments where she’s miserable without him and thinking about losing him and she just wants him happy and doesn’t want him hurt. His mom tells her that those are signs of love. But Becca still says that she’s not ready to say yes to a proposal and the more his family talked about Arlington the more stressed she felt. She feels she and Chris just need to talk, but there isn’t time on this date. Chris then has one last date with both women to figure out what he wants to do. Chris has a date with Becca first. His face just lit up when he saw her. They sit on the bed together and have a talk. He asks her if she can see herself with him, in the small town… how does she see herself? She says that she’s just so excited to be together but she can’t make any promises as far as a timeline in which she would be ready to pack up and move and be with him. He seems very serious and sad…. and sweaty. He’s sweating a lot. He tells her that’s scary and he doesn’t know how to take it. She says that she wants to be married and wants to have kids, she just doesn’t know when. He then asks, “why don’t you feel like you’re in love with me?” She says she doesn’t know and she wishes she could give an answer, but she just doesn’t know. She says the one thing that she does know is that she wants him, but everything else is fuzzy. He then asks, “If we fell in love, what would hold you back from being together and having a family. Straight up honest, and don’t hold back.” She says, “I guess the uncertainty in what I’m going to do when I move to Arlington and not just taking on what you do.” He asks, “what scares you the most?” She says, “Getting there and then wondering if it’s for me…. what happens when I get there and it’s not….” He tells her that he would have her back and they could figure it out. She said, “I can’t wait.” And then they shared a really strong hug but they both look a bit sad. Chris is pretty emotional in his interview and breaks down crying. Whitney’s date… He takes her to his farm. She is so excited to be there. They are harvesting corn. Woohoo!! (sarcasm) He shows her the whole process of how corn is processed. He drives her around and shows her all the farms that his family owns. Huge amount of farms! Then they arrive at Chris’s house. Whitney says it just feels 100% right. Chris has a beautiful home and Whitney says that she feels like home there. She again tells him that she loves him and wants to be with him. Back at Whitney’s hotel, and Chris is hoping for an “ah-ha” moment when everything just clicks and feels like he’s making the right decision. Whitney shared her excitement for Arlington and small town things. Then she says they need to get a little more serious and she has some questions for him. She asks him if he has any final thoughts before they go into the final decision. He asks her “what makes you feel so certain about you and I?” She tells him that he’s exceeded all expectations she had of him. Whenever they’ve been together, he’s made her feel comfortable. And it just continued to get deeper and that sometimes it’s not something you can describe, it’s just something you feel. Sometimes you can’t explain it, it just is. He looks serious and almost sad, like he’s forcing a smile. I’m having a hard time reading him. He said “what you just said is something I reciprocate and feel the same way… no matter what happens.” Yikes! Talk about mixed signals… what is that supposed to mean?! He said he feels good about being there with her. But he looks sad…. is he sad because he knows he has to break up with Becca or is he sad because he doesn’t want to pick Whitney even though she’s the better choice? Next morning, Chris says he’s still undecided. Even as he looks at the engagement rings, he’s unsure which woman he wants to give it to. Whitney and Becca both look so beautiful in their dresses. I have no idea what Chris is going to do, but I would not want to be one of those girls right now. Especially being the one he picks and watching this unfold. I would want the man who picks me to be 100% sure I’m the one he wants to be with and not some other girl. He says he may not propose to anyone because he’s so torn at this moment. Meanwhile Chris Harrison keeps teasing us that something shocking is going to happen on “After the Final Rose” special! Suspense is killing me!! The final rose takes place in a barn that they have really decked out. Chris says he’s devastated to make this decision he has to make…. to break up with someone. The first girl out of the limo is…. Becca. Whew. Even though this is painful to watch. Oh but he just greeted her and kissed her. He tells her all about the things he loves about her. And he says that he can see her being his wife….. but she’s not really ready. He doesn’t think it’s fair to either of them. He doesn’t think he’s the guy to give her what she needs. Becca gracefully says that she appreciates him being so honest and he’s going to be a terrific husband. But then he walks her out. Becca doesn’t even seem very sad at this point. Driving away in the limo, Chris is more upset than Becca seems to be. She says she’s in a state of shock, but she’s not crying. She said she just can’t process it. She really doesn’t show much emotion at all! This is kind of crazy to watch. She just really doesn’t seem to care! So now… will he propose to Whitney?? She is standing before Chris and just trembling. I think it’s nerves and how crazy cold it is in there. You can see their breath. She gives him a speech and she just lays it all out about how she feels. Chris takes a deep breath and smiles and tells her about how each moment was special and how natural and easy everything is. And he tells her he loves her and he gets down on one knee and asks her to marry him!! I’m kind of shocked honestly. I thought he would pick her, but I was really unsure if he would propose or not. Yay!!! I just wish he was more certain about it from the beginning of tonight’s episode. It kind of makes him a little schmucky. He then gives her the final rose and they tell each other again they love each other. I hope they’re happy and they last! I don’t know how I would feel being her and watching this episode though!! Okay…. stay tuned for my recap of After the Final Rose! Posted by amandatalkstv on March 10, 2015 in Bachelor Season 19: Chris Soules and tagged becca, Chris Soules, The Bachelor, Whitney.